The New Lamb Shoulder Rack makes the Cut at Las Carretas! It’s my first visit at Las Carretas Restaurant and Bar. I love Mexican food and have been wanting to pay this restaurant a visit but somehow never made it. One evening, I was invited to by Meat & Livestock Australia (MLA) in Malaysia to check out a new cut of Australian grass-fed lamb at the restaurant. Las Carretas owner and Chef Victor Siow is proud to showcase his creation of the new cut of lamb that is available at the restaurant for the whole month of April. 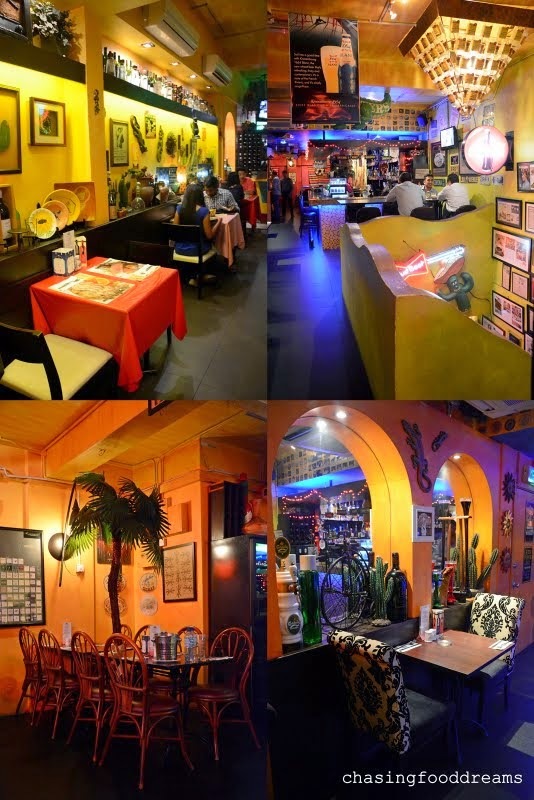 Las Carretas has three outlets at Damasara, Ampang and Subang. The Mexican restaurant has been around for more than a decade and has been a favorite place for Quesadillas, Enchiladas, Tacos, Fajitas, Steaks and lots of Margaritas. All outlets showcase bright color themes to reflect the Mexican spirit. The outlet I visited at Subang very much welcomes me at sight with its bright and cheerful décor. Bright yellow walls are flanked with lots of art pieces and ornamental items. The space is tight with furniture and a cheeky display of trees sit right smack in the middle of the tables for an added element of fun. The bar is set at the end of the room and seems to be a favorite hangout for everyone since it was pack that night. There is more seating available upstairs and there is also another bar as well. There is also a wall of fame filled with numerous write-ups of the restaurant. After all, Las Carretas is the perfect place to hang out with their signature Margarita after a long’s day at work! The evening had to start off with a gorgeous glass of Margarita! The one here is as good as what the rave has been… strong with tequila and lime. A sip of this Margarita will make all your problems go away… at least for a while… and that’s absolutely fine by me! Wines are also available besides cocktails and liquor. We tried a lovely white and a bold red and enjoyed both with our dishes. We were here for a taste of the Australian Grass-Fed Lamb Shoulder Rack promotion as mentioned earlier. Using lamb shoulder racks which is deemed a secondary cut, Chef Victor and team has brilliantly succeeded in using modern cooking technique sous vide to break-down the meat protein in this cut, rendering a sumptuous lamb dish that can easily take on the expensive lamb rack cut. The lamb is carefully sous vide in a water bath with a precise temperate for more than 16 hours, as I was told, before being finished off upon orders. For RM69++, one can enjoy two pieces of divine Pan –Seared Lamb Shoulder Rack served with homemade mushroom risotto cake, sautéed zucchini and sauce. Our plates arrive beautifully pink and utterly luscious at sight. The outside of the shoulder rack has a beautiful sear and oozes with loads flavors. The lamb racks are so tender that it really didn’t take any effort to cut into the meat. The meat still has a lovely bite despite the tenderness. The accompaniments are delicious as well. Crispy risotto cake makes a creamy and contrasting texture to the meat while lightly sautéed green and yellow zucchini is sweet. Enjoy the lamb shoulder rack with a choice of ginger & thyme sauce or light blue cheese sauce. There is 30 minutes waiting time but it is worth every bite. Besides the main star of the dish, we also enjoyed other dishes prior to it. We kick start our meal with a classic favorite in any Mexican restaurant, Nachos. At Las Carretas, Nachos goes big and is served piled up with Muchos Minced Beef, Shredded Chicken or Sautéed Camarones Shrimps. We dug in under the gratinated pile of nacho chips filled with relish, jalapeno, enchilada sauce and lots of cheese with our protein. We tried the beef and chicken versions and both were equally addictive. For those who must stay true to its origin, there is a plain version too. Our next dish is a tasting portion of Camarones al Ajillo features lightly sautéed shrimps cooked with jalapenos, bell peppers, olives, tomatoes, garlic and cilantro. It has a soupy base and comes with toasted baguette to mop up the lovely spicy tomatoey sauce. It looks simple but it packs a decent dose of strong Mexican flavors in this appetizer. Mussels in Coriander and Habanero looked innocent when it arrived. Black mussels are cooked in a creamy sauce and sprinkled with chopped coriander stems. Flour tortilla is served to be enjoyed with the sauce. This dish turned out to be one of my favorite that night. The flavors are bold and spicy. Lusciously creamy with strong habanero heat really pumps up the flavor sense. The mussels are soft and juicy and the tortilla is simply perfect to mop up all the sauce. My tasting portion left me craving for more. Rest assured, I will be ordering this dish again! We ended with two desserts shared among us simply because we were full. Both Boca Chica and Homemade Brownie are served with scoop of vanilla ice cream. Boca Chica is layered sponge with hazelnut and coffee served with ice cream, chocolate sauce and a light sprinkling of cinnamon. Homemade Brownie is a fudgy chocolate brownie that oozes dark bittersweet cocoa that matches so well with the vanilla ice cream. It’s was a lovely and sweet ending. 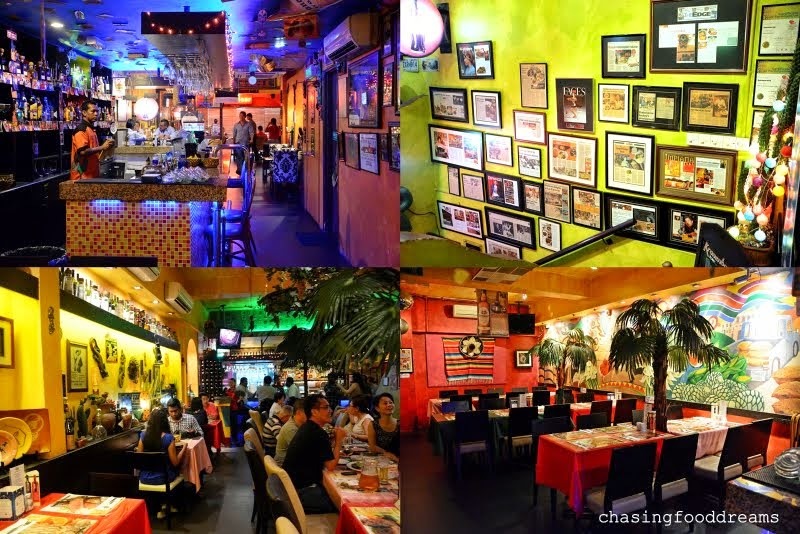 There are lots of other dishes that I really want to try at Las Carretas. I am really looking forward to making a return soon. For the month of April, don’t miss the Australian Grass-Fed Lamb Shoulder Rack promotion. Oh… and you really should try the awesome Margaritas there too! Wow! Sure looks good. The nachos with minced beef too - such a pretty sight! That lamb rack seems awesomeeeeeeeeeeeee!!! !